Manufactured using graded steel, our dual shaft dispersers are known in the market for ensuring long service life. 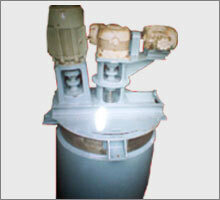 These machines comprise two agitator shafts, and are available in different sizes and capacities. One of the shafts operates at high speed and the other at slow speed. As per the requirement of clients, we can make these twin shaft dispersers available in 500 kg, 1200 kg, 2500 kg and 4500 kg capacity. Suitable for Distempers, Plastic paint , Exterior emulsions & premium wall finishes for Paint, Pigment, Dyestuff, Coating Printing Ink, for mixing, Dispersing, grinding.